The piano at St Pancras International is there for anyone to use, free of charge for both their own and others' entertainment. This has proved a big hit, with many people giving public performance a go. Here it is just you, the piano and the public. Those that can't play are quickly found out. Those with talent shine though! One particular evening I was there, and could hear someone playing with obvious talent. He had a true gift which was clear to anyone who took the time to listen. He played song after song, with many random onlookers and people stopping. I later found out his name is Benjamin and he said he had come over from France a couple of weeks before, but was homeless here in Britain. His cover of Wrecking Ball the hit by Miley Cyrus is incredible, and would be a true shame if his talent goes to waste. Most people living rough on the streets are there through no fault of their own. Many of them probably have hidden talents perhaps they don´t even know about. There are many tales of homeless people who were once doctors, teachers, scientists or other similar positions. Many have university degrees, and others are like Benjamin with a musical or artistic talent. It is tragic that anyone is forced into a lifestyle where they don´t have a roof over their head or a place to call home apart from the streets. The great tragedy is that most homeless people live a life of isolation and in a state of almost invisibility to the public, because they are judged by their outward appearance. Very few are able to show what they can really achieve or are capable of, because they very rarely get given the chance. 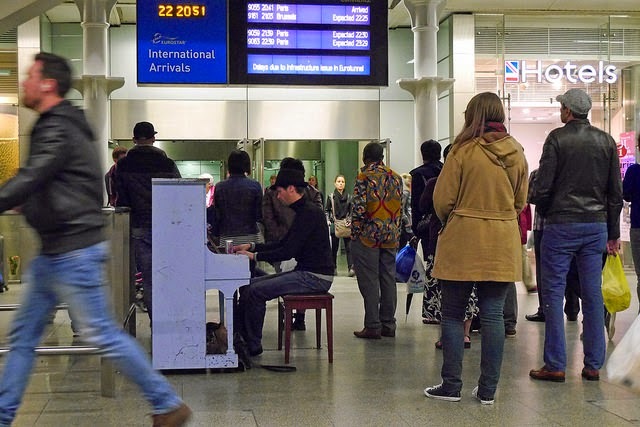 Benjamin was able to show his musical ability because of the public piano in London St Pancras, but few homeless people will ever get even this kind of opportunity. I hope that there can be greater awareness about the tragedy of people living rough in city streets across both developing and supposedly developed countries. Please share this post if you liked the video!